ST PETER, Minn. (AP) - It's not uncommon for Marty Davis to leave his Cambria office in Le Sueur and travel south to St. Peter for lunch. It was during a trip back to work last year, along a strip of Highway 169 he's driven hundreds of times before, that the inspiration hit him to turn a landmark pop can silo into an advertisement for Cambria, where he's co-owner and general manager. Before becoming a cylindrical billboard for Cambria, painted black with the countertop manufacturer's name in large white letters, the silo was most recently painted to look like a can of 7-Up. Prior to that, the silo between St. Peter and Le Sueur looked like a Coca-Cola can. "I called my assistant and asked her to find out who owns it. I wasn't even two miles past the silo yet." When Davis returned to his office, he was told Lee Boyum owned the silo. Peter Martin, Cambria vice president of marketing and sales, was told to give Boyum a call. "I contacted the land owner," Martin said. "We worked out a deal and painted the silo." Almost as quickly as the deal was done, Cambria was notified by the Minnesota Department of Transportation that it couldn't advertise on the silo without permission from the state. It was too close to a major highway. That notice, which also said the advertising had to be removed within 60 days, triggered a series of legal maneuvers that could take months to unravel. The company has appealed the MnDOT order twice, first using Nicollet County Attorney Michael Riley and his wife as business representatives, then using Boyum as the land owner. Riley's case is over. Boyum's case is just beginning. Riley is a part-time county attorney with a separate private practice. MnDOT had raised a question about whether Riley's involvement was a conflict of interest. But he said his former involvement in the project was a business deal that had nothing to do with his work as county attorney. Nicollet County District Court Judge Allison Krehbiel has granted an injunction that has delayed the removal of advertising. The state and Cambria are scheduled to be back in court Aug. 27. Prior to that, on Aug. 16, Cambria and Boyum are scheduled to go before Nicollet County's Board of Adjustment Appeals. It's a board of five residents that considers appeals when variance requests are denied, said Mandy Landkamer, Nicollet County Environmental Services director. This is new territory for the board, which usually hears appeals related to setbacks for buildings on residential property. Cambria's application is, "To allow for the continued use of a silo for storage of a small amount quartz and displaying its company logo." If Cambria's request is granted, Landkamer said she doesn't know what the implications will be for the existing court case. Officials at MnDOT aren't sure either, said Rebecca Arndt, District 7 public information coordinator. Officials there have been down this road before, Arndt added. The district has one full-time employee who spends a majority of his time dealing with sign issues along the district's highways. About a decade ago, the state spent months trying to get Pure Pleasure, an adult entertainment business in Mankato, to remove a sign from the intersection of Riverfront Drive and Highway 14. In that situation, public opinion seemed to favor the department's action. 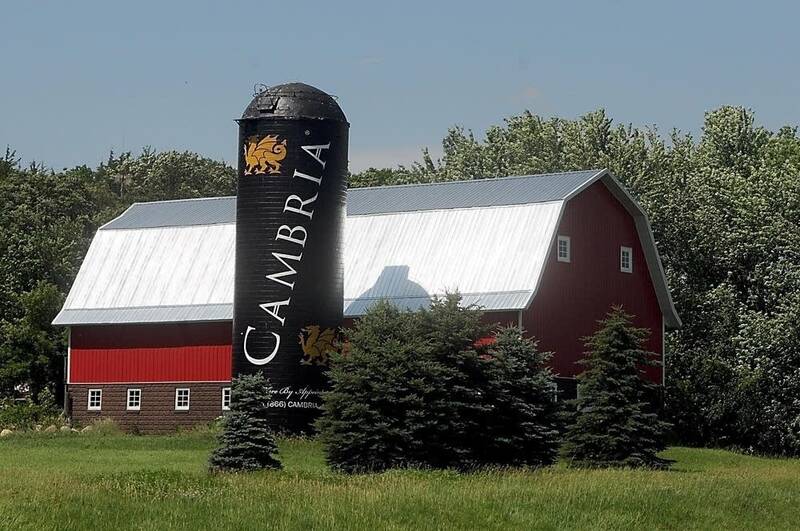 This time public opinion seems to favor Cambria's advertising, which improved the look of the silo and barn. Laws have to be enforced equally for everyone, Arndt said. Martin said Cambria plans to do what it can to keep the advertisement. "We're certainly prepared to exhaust every means possible to keep that landmark," Martin said.